Jakub Pitha, Times Square. Holga photograph. The Hong Kong factory where the Holga camera is made has announced that there will be no more. "…all Holga tooling has already been thrown away and there is nothing available for sale," a spokesman said, according to an announcement on Freestyle. Current stocks in stores are all that are left. The mostly plastic, very cheap Diana camera became a hot thing in the 1970s, with aficionados turning to a "lo-fi" sort of aesthetic as a reaction against ever-escalating image-quality perfectionism. The Diana soon went away, but by the '80s the Holga stepped up to take its place. Once the newcomer, it has long outlived the original Diana and the original fad, enduring for 33 years according to Freestyle. There's nothing quite like the look of its large negative and simple plastic lens, which has now inspired huge amounts of work and many mimicking apps, not to mention Holga interchangeable lenses to get the inimitable look on Nikon and Canon DSLRs. (No word on whether those will go away too.) Google "Holga photo" and hit "Images" and enjoy some of the great freewheeling work people have done with these highly limited cameras. Jakub Pitha told me he bought two more for when his first one wears out. Then he added, "...they are made half-worn out, but you know what I mean." We do. Holga, we hardly knew ye! David O: "I confess, I'm a Holga user. I like the way it distorts the images and you never know exactly what you will get when the film is developed. Keeps photography fresh for me. I've got two at the moment, a yellow one for color and a black one for B&W. I wouldn't use it for my only camera but it allows me to embrace randomness in my pictures." David Bennett: "I have never wanted a Holga until now." Mark Cotter: "Some of my most interesting photographs are taken with the Holga. I used to like experimenting with double exposures on it. There is now a digital Holga—it was a Kickstarter campaign. Don't know how widespread it will become." Darlene: "I remember shooting my mother's Diana camera way back when. It was one of the neatest experiences I had as a young artist. It produced lots of cool blurring and vignetting; I had never seen anything like it before! It was my first step into creative photography, and shortly thereafter, a Polaroid camera and film showed up and I never stopped photography from then on—I was hooked!" Roger Bradbury: "The Diana a hot thing in the 1970s? I had one in the 1960s! Take that, yer bunch of trendies! :-) "
Steve Snyder: "I was a long time Holga user going back about 15 years. I was even published in a couple of Toy Camera magazines back in the day, but as time has marched on I've grown weary of the Holga aesthetic and the whole Lomography movement. Anyone else feel the same way?" David Burnett: "There seems to be an unending flow of news which dismisses some sweet tool of the past, and Holga is no exception, though I hope someone, in the spirit of New55, manages to buy some of the dies and equipment before it's all tossed into the garbage heap. I have used Holgas as an ancillary camera (light enough you never really complained about its weight) to whatever else I was shooting, 35mm, digital, medium or large format. If something was interesting, it was a little more interesting as a Holga image. It seemed to fit the perfect spot, between the ultimate search for sharpness and perfection and a photogram. "What always annoyed me was when photographers would have a special 'Plastic Camera' page on their website. To me, it's either a picture or it isn't. Just put the pictures with the good ones, and show me those, and if I'm clever enough to figure out it was a Holga, so be it. But it was, like a Speed Graphic or a X-Pan, just another tool, and one which had its moments. Randy Smith, the great after-market genius in upstate NY, created a whole new genre of Holgas by inventing the Bulb shutter, cable release, and a few other little improvements which actually made the camera competitive. I just bought a couple of the last batch, had Randy add a cable release (honestly, is there anything better than a four-second Holga exposure?) and they sit on the shelf awaiting some manifest moment as yet to show itself. And even the 'creative tools' on the newer digi P&S cameras isn't quite like the Holga itself. Viva Holga." "Know thyself" (gnōthi seauton or nosce te ipsum, in transliterated ancient Greek and Latin respectively), which according to Pausanias was inscribed in the forecourt of the temple of Apollo at Delphi, home of the celebrated oracle, has been variously attributed to Bias of Priene, Chilon of Sparta, Cleobulus of Lindus, Heraclitus, Myson of Chenae, Periander, Pittacus of Mytilene, Pythagoras, Socrates, Solon of Athens, and Thales of Miletus. It's one of the pithiest and most problematic maxims in philosophy and—more lately—psychology. I was particularly taken with that last line. Surely, the payoff of self-knowledge is indeed liberation. If you really know who you are, it helps you to know what to do; and if you really know what you're doing, it's a lot easier to do it. I lost a review client, but I think Tom got a whole lot of benefit out of thinking about it. Works for me if it works for him. Good cheap SD cards; and the very best SD cards. Andrea Costa: "Uhmmm.... Many times I've heard people saying 'I'm not a serious photographer' in a radical-chic, smug way, like they are saying 'I'm really different and for this I'm so better than them.' You know, a passive-aggressive demeanor. I, for one, started with snapshots, then moved to portfolios, and I find that I'm very happy when I shoot projects that I can show to others. (You have no idea how liberating it has been to accept this….) :-P "
Mike replies: Like you, I'm also happier when I strive. That's what lets you engage with the problems—technical, psychological, procedural—and the problems are all interesting, in my view. My idea of liberation would be to get more serious, not less. But for each of us it's different, and I take Tom at his word that his conclusion is the right one for him. Wayne: "For me, happiness resides in the effort; the photograph is simply a reminder that I was there and engaged. Somehow, I managed to leave a thumb-print on one of the my favorite shots from the first roll of film I hand loaded in a reusable film canister. It does not seriously detract from the shot,but it is there...forever; my brand. Imagine if HCB had done the same thing on his photo of the man jumping over the puddle. What would be more prized today? A print including the thumb-print, or a print not including it? Fact is, if HCB were too hung up on what others thought, we would probably never have had the joy of such a photograph in the first place. "Don't just 'know thyself,' take pleasure in learning about thyself. Photography is a perfect tool for the effort." Anthony Shaughnessy: "I've often wondered at the disappointment I used to get on some days when I go out and shoot. I've recently realised it's because I want to shoot mountains. I was shooting in other places that just didn't do it for me. I've been fortunate to be able to concentrate on mountain scenery for the last year or so and I'm far happier with my photography and where it's going." Mike replies: That's an incredibly important revelation, right at the core of self-knowledge as a photographer: what do I really want to shoot and how do I get to go do that? James: "I'm an unhappy snapper...I long for a project, some set of images that could be called a portfolio, something to do with this hobby. But no matter how hard I try, I just keep snapping away and posting single images or small series on my blog, which gets about 100 hits per day, mostly to a review I wrote about an old lens that didn't have much other coverage. A couple of people reflexively like the G+ autoposts that come from the blog, but other than that, I get no feedback, probably partly because I don't give it to others and don't much participate in any of the online photo communities. Virtually everything I listen to or read seems to push towards a some sort of comprehensive, realized thing, and despite trying for several years, I've yet to even define what I want to shoot, much less what I want to get out of it. It's very discouraging at times. But the rest of the time, I just really enjoy shooting, learning things, trying things, etc., and I wish I could learn to focus on that and ignore the impetus to make something of my very enjoyable hobby." Animesh Ray: "In Sanskrit, Atmanam biddhi, or know thyself, is the central tenet in The Upanishads (~650-700BCE), which would place it at about the same age as, or perhaps a hundred years earlier than, Thales of Miletus, perhaps contemporaneous of most of the sources you quoted. Why did people in 700BCE suddenly get this philosophical insight in apparently far-flung places?" My friend Kent coined a nice term..."Quality of File," which of course approaches cuteness because "file" is "life" with the two consonants switched around. He sent me a bunch of pics, and I asked, in return, "Is the sensor in that Dƒ the best sensor ever, or what?" It's the same sensor as in the pro D4. And, logically, as Thom Hogan pointed out, it's the sensor that should have been in the D750. So right about that. But I like that term, "QoF." Many Canon shooters, for instance, are unperturbed that Canon has gone from leader to lagger in many sensor stats; they just love Canon's QoF, and that's that. The Leica S also has QoF by the gobs. So do the Sigmas. Fuji divides people based on their QoF reactions to X-Trans. And QoF seems to be what many people feel is naggingly absent from their otherwise perfect-for-them cameras o' choice. Chris M: "I like this idea a lot. The camera that defined QoF for me was the original Canon 5D. I've used a lot of different cameras with sensors that measure much better in the lab since I owned my 5D. Still, I'll open up a file from the 5D on occasion and will still blown away at how nice it is. This one has always been a favorite and this one still takes my breath away every time I open the full resolution file." tex andrews: "Pentax 645Z, QoF, baby. Just amazing." Daniel: "Finally tried the Sigma DP2 Merrill and QoF is more than enough to make up for camera handling shortcomings. Even more so when used carefully as as one would a View Camera." Happy Easter to all of you who are Christians, and to everyone else who celebrates it in whatever way. "Using a pinhole camera made of an aluminum can, duct tape and photosensitive paper and positioning the device atop Sterling Hall from winter solstice to summer solstice, [the picture] yields a symmetric chart of the sun's path across the sky. The lowest arc was the sun's winter solstice trajectory and the highest arc was the sun's path at summer solstice. Gaps between the arcs are days of overcast weather." I've come to life late, late, late, past my time and past my prime. Too soon alt, too late schmardt. The following absolutely fell out of the sky on me two days ago, by a most curious chain of unlikely coincidences. I've watched it several times now. It seems both true and beautiful, so I thought I'd share. The speaker is Robert J. Waldinger, a psychiatrist and Harvard Professor who is the current Director of the Laboratory of Adult Development at Massachusetts General Hospital, and this short video is about the secret of happiness. I wouldn't know, but I believe. So happy Easter, happy Spring, happy "cruellest month," and happy rebirth and rejuvenation to you in your life. And if you see a rabbit in a suit without pants hop by, I do hope you're keeping your camera at hand. "Open Mike" is the editorial page of TOP. It appears only, but not always, on Sundays. Gabe: "There's something about the way a person speaks, a gentle voice, a considered manner, a humorous outlook that draws you in and keeps you listening. Instead of a 'get to the point' it arouses your curiosity...the intent to learn being one of the very best traits. The topic itself is complex, indeed could have wound up with disheartening conclusions (as in 'it was a study of a privileged few'). Instead it's something I'd like to send to everyone I care about, indeed almost everyone I know. In a spiritual way, I share in the message of Easter. Thanks for pointing it out Mike, and chocolate eggs to you and yours." David Miller: "A lovely video, and one whose wisdom seems well-founded. There was only one moment that left me puzzled and a little sceptical: around the 12-minute mark Waldinger talks about the questionable rewards of a life spent 'working harder and harder,' and quotes 'that truism that nobody on their deathbed ever wished they had spent more time at the office.' I suspect that some people might wish they'd spent more time in a darkroom, or behind a camera, or at the easel, or making or listening to music, or reading or writing, or in the lab, or treating patients. Waldinger seems to presuppose that 'working' is something we do primarily for money. Undoubtedly that is often the case, but not always. Having spent most of my life earning a living in various kinds of art—dramatic, musical, literary, photographic, graphic, and healing—I often regret there are not more hours in the day to spend working. In this I am very fortunate, but among my many friends and colleagues who work creatively I am far from unique." We're in the process of redesigning TOP's look'n'feel. The primary goal is to make it mobile-friendly, responsive to being viewed on tablets and phones. A secondary update will be improved sharing—the usual connections to social media, with an email-this-post function. TOP v.2 has served us well, considering I slapped it together in crisis mode in June 2007 in a fluster and a rush. But it's pretty dated now. Most important is this little site, Google's Mobile-Friendly Test. If you don't pass, Google downgrades you in searches. This has hurt us substantially since they switched over last Summer and it needs to be fixed. Nothing substantial will change much. It will still be a "vertical photography magazine" in blog format with daily postings. Unfortunately I think the illustrations will have to stay the same, small JPEGs that open slightly larger when you click on them. We'll be losing our tan background color and going to white. The look of the site will be simpler and plainer. We'll have an actual logo, although it will be simple and no-nonsense and rather unhip. Social media connections will be Twitter, Google+, Facebook, and—? Any preferences? The links to Amazon and B&H will be little boxes at the end of each post. There will be a "Like" button to help give me an idea of the popularity of specific posts. No word yet on when. We're working on it, check's in the mail, ask your mother. Any comments? What would you like to see in TOP v.3? Yesterday's post elicited a large number of comments—the longer, thoughtful kind—and I'm going to have to work on that this morning. Please do check back later to read some of them (I'll feature a few this time, but many people had interesting and insightful things to say). Meanwhile, just curious—anybody use a binocular harness as a camera strap? How does it work? I think I hurt my neck using it as a post to drape heavy cameras around in my youth, and it just won't stand any weight at all. Even with today's light cameras it starts to hurt in no time. Just wondering how binocular straps work for cameras and whether it's a viable solution in practice. Incidentally [digression], you know I never write about pool here on TOP, and I've mentioned all this before, but playing pool had a very big surprise in store for me when I started using it for recreation. I originally got a pool table (now sadly departed) because my doctor told me I needed to get away from the desk and move around several times during the day. It actually worked just great for that—I'd get up, migrate to the basement, throw the balls out on the table and knock 'em all down a time or two, then head back upstairs to the computer. The great surprise was that, after at least 20 years of chronic neck pain that didn't seem to respond to any kind of treatment, my neck pain went away entirely within weeks! Miracle of miracles. I'd been afraid that pool would make my neck pain worse, or that I wouldn't be able to play at all because of it, but instead, to my happy astonishment, it cured me. Now that it's been more than a year since I've had a table, my neck pain is returning. It's not as bad—I'm in better health now because I walk-jog when the weather permits and do my pet NYT 7-minute exercise, the perfect exercise for people who don't like to exercise—but I miss pool. I know it's laughable and entirely preposterous to claim that I played pool for health reasons—makes me chuckle even to write it—but that's my story and I'm sticking to it. Today's cameras are potentially small and light enough that they probably give very few people reason for concern, but my neck is like Incurable Sh**ty Ankle (if you haven't seen that bit, on one aspect of aging, I highly recommend it for anyone over 40, or younger people who want to know what's coming. It's got some profanity in it, and I know some people don't like that, but it's a classic). Jeez, I just meant to ask one simple question and now it's a post. I guess I just think in six-paragraph chunks any more...anyway, don't miss the comments to the previous post, but please give me a while. I'm a-workin' on it. Moose: "There are, to my mind, two distinctions to be made to the concept of the harness shown at your link. First, there is a difference between binocular and camera harnesses. The topology of binocular and camera harnesses is the same; just the materials and connection details are different. It would seem from your link that this distinction has been largely lost in marketing, but I think it's still useful in finding the right tool. "The harnesses I use on our binoculars use rather lightweight round nylon cord, about 1/4" dia., and simple metal connectors. One may just put it over the neck, like a simple strap, or put one's arms through, to wear it as a harness. Must be perfect for our binocs, as the one I put on our largish B&L Waterproof Elite 8x40s has been there for about 20 years, and when my wife Carol wanted one for some newer, lighter binocs, she wanted the same thing. Too light for a serious camera and lens, as the thin cord would start to cut into skin. On the other hand, the more serious harnesses at the links look like too much for me and binocs. "Camera straps use wide, flat strap material and connectors to spread the load. Again, there are important distinctions to be made. Some use stretchy straps, which I found I quite dislike, and others use regular nylon straps. Many, as in your link, use a single connection point on the back. When I was finding the right one for me, I found a dual connection system more comfortable and useful. It allows the part on the front where the camera connectors slide up and down to be vertical longer, before it starts wrapping around to the back. The one I ended up really liking even allows adjustment of the length between rear connectors. "Here is how a good camera harness fits on my body. "I haven't used the harness since switching to Micro 4/3." Jim Mooney: "I'm going to have to start wearing a tinfoil hat to protect me from the TOP mind scanner ray. This is probably the fifth time in the past two years that I've been mulling something over and you publish a TOP article on it. Going to try it with my new-to-me G1X. I've been wanting to try this for when I hike so that the camera is readily accessible but not tugging on a shoulder or belt." Jayson Merryfield: "Speaking as a wedding photographer, harnesses and strapping systems that take the weight off your neck and redistribute it to your shoulder are all the rage these days, and have been for quite some time. The trendy types have preferred the Holdfast Money Maker for a few years now." David Miller: "Response from a retired physiotherapist: Yes, Mike, playing pool makes perfect sense as therapy for chronic neck pain associated with too much time at your desk. A good physio might be able to sort out your sitting, keyboard, writing surface and monitor positions to diminish your neck problems. A couple of added postural correction exercises would eliminate the problem completely. But in all honesty a pool table offers a better solution for you—you've already proven that. This is a perfectly serious physiotherapist's directive, Mike: for the sake of your health get a pool table. (In the past I have often prescribed: 'Patient is to get a dog,' and on one occasion of which I am still very proud: 'Patient is to get a horse.' A pool table is small stuff compared to that.) I'm glad you've found a tolerable exercise program. Keep on with it…but first knock a few balls around." Mike replies: I actually talked my doctor into agreeing with me that a pool table might be a good way for me to get out from in front of the computer on a regular basis, and I almost got him to write me a prescription for it—but then he had second thoughts, thinking it might make him liable to an accusation of insurance fraud. So he told me to go ahead and get a pool table but he didn't give me a prescription for it. I was only going to frame it and put it on the wall in the basement next to the table, that's all. Just thought the symmetry was amusing, no big deal otherwise. Carry on! Michael Walsh: "Hi Mike Well I won't comment then in case I ruin the symmetry—oh bugger"
I suspect this will interest some of you...but others not as much. After all, photographers are not in the camera industry, nor are we tied to it, really. The only question a photographer really needs to ask is, do I have what I need to do my own work? And from what I can tell (tell me if your opinion differs), we have seen no decline in the richness of what the camera industry is providing. My feeling is that we continued to be treated to a wealth of new offerings and timely updates, that development is still proceeding almost faster than it's reasonable to catch up with, and that we have, if anything, too many choices of good tools rather than too few. No surprises here, but it's good to keep up. Andy Sheppard: "Without even starting the video, the stat that I find most shocking is the one to the right of screen—'the ENTIRE camera market in 2015 is less than 30% of what it was in 2010.' That is one hell of a dramatic decline...."
Mike replies: Yes, but you'll notice that the decline is mostly in digicams a.k.a. point-and-shoots—fixed-lens small-sensor compacts, the market for which is being obliterated by smartphones. We've known for some time that that's happening, and we foresaw it even before it started to happen. You'll notice that the change in interchangeable-lens cameras, which are what most photographers care more about, has been much less dramatic. Bill C: "The state of the camera industry should be of interest to both the serious amateur and the professional photographer. Understanding what business drivers will influence manufacturers can help shape what we invest in, from specific models of bodies or lenses to entire systems. Take for example the exit of Samsung from the digital camera market. I've heard some exclaim surprise at this, but industry performance made it clear that at least one or two of the middle players were going to get squeezed out. One can't help but wonder about Ricoh, as well, given how far they trail the other ILC manufacturers. The major camera manufacturers are still very much catching up with the current state of the market, and I think we'll see more impact from this in the next few years. Contraction of model lineups, perhaps the exit of another manufacturer (or two), and probably a growing trend in price increases all seem likely." There are very few magazines left for people who have the patience to read essays of 3,000 words or longer. But I don't think it's because people are illiterate, or less intelligent, or have attention spans that are too short, or aren't willing to expend the effort required by attentiveness. I think it's just because people don't have time. I've noticed over the years that TOP's readership skews older. Or at least its Commentariat does. But I don't think that's because I talk about history and traditions. I don't believe it's because I remember Hot Wheels and Hula Hoops and so do they. My sample size makes my data anecdotal, but I think it's because we tend to "get into it" here—with longer discussions and multiple comments and links—and a lot of younger people (~30–50 maybe? 25–45?) just plain don't have the time to follow along very often. The eight-hour day had its origins in the 19th century, along with the child labor laws and other labor movements. The idea was that, if people were forced to work in coal mines or cotton mills or farm fields for 10 to 16 hours a day, six days a week, their quality of life was being imposed upon too drastically. The history of the eight-hour day is long and lively, with inconsistent and incremental gains, much opposition, and a great deal of the kind of political posturing and "proclamations" you might expect—along with florid rhetoric: one labor union (at least) used the term "capitalist slavery." The first general strike in the United States, in 1835, was by Irish coal-heavers. Their demand? They only wanted to work 12 hours a day, with two hours for meals, six days a week. The driving impulse was mainly humanitarian. These days, unions are in steep decline (most of our labor has moved offshore), and the labor movement is a quaint artifact of history. We have a sleepy little holiday to commemorate it. The eight-hour day is a landmark from way back, a speck on the horizon in our collective rear-view mirror. Except it isn't.The eight-hour day itself is what's becoming a thing of the past. It's just that now, it's white collar workers and professionals whose "labor" (time) is being exploited! With good jobs scarce and corporatism rampant, the incendiary notion of "capitalist slavery" might more rationally apply to people such as associates at legal firms, medical interns, and mid-level managers of many descriptions. And yes, even government workers. My father was a Director of NASA years ago, and told a story of a time when Jimmy Carter was late for a meeting with a room full of high-level officials. As all those very busy people sat there hour after hour wasting their time, Carter's functionary offered the excuse that the President was very busy because he "worked 70 hours a week." That excuse backfired—my father said he doubted there was a single individual in the room who worked as little as 70 hours a week. Medical interns are overworked so excessively that recent reforms have limited the hours they're allowed to work to 80. (Eight-zero.) "I didn't have time to 'sh*t shower and shine' back in the day," my brother Charlie, a pediatrician and internist, said to me. I've heard tales of Silicon Valley startups offering their workers sleeping accommodations for when they just don't have time to go home and come back. Add kids into the mix and you start to get an idea what younger adults are dealing with. And not only that, but "connectedness" is having the unwanted effect of letting workplace obligations sneak into formerly personal times and places. "Eight hours for work, eight hours for recreation, eight hours for rest." Sounds nice to some of you younger people with "good" corporate jobs, doesn't it? The phrase was the utopian goal of the Scottish socialist Robert Owen in 1817. It was more than 100 years before it would become a legislated reality in many nations. Now, it's something older people have earned, but few younger people with "good" jobs get. If you've read this post this far, you've already read 715 words. That's already just too much for people whose time is severely limited...people with corporate jobs, kids, and long commutes, and who will have to check company email before they go to bed. So yeah, a lot of photo enthusiasts are older. And a lot of TOP readers are older (or retired even though they're not older, or they're professional photographers, or photo teachers, or they work at the higher—in some cases the highest—levels of their companies). It's simple: they're the ones who have time to take pictures and talk about it. I could go on, but I think I'll take it easy on you. You probably have other things to get to. Craig Munro: "You're absolutely right Mike. As a 40-something with a family and 10–12 hour days, it's hard enough to prioritise 10 minutes to read an article on TOP, never mind find the time to reflect on it for long enough to put together a coherent comment. And then after all that somehow I need to squeeze in some photography time. It's enough to make a person look forward to retirement!" Bruce McL (partial comment): "My neighbor worked on the original Toy Story movie. For months I would go to bed with the sound of her car driving into the apartment parking lot, and wake up to the sound of her driving back to work. After the movie was released, she had time to talk about how intense it got there. They provided laundry service on Saturdays—she brought her dirty clothes to work and they would be cleaned while she kept working. "At least she has something to show for all of that work." A. Dias: "Long hours in Silicon Valley companies is the norm and has been so for many decades. People do it because they have the motivation to do so. Nothing wrong with that. Opportunity and choice is where it's at, not some government mandated regulation which leads to common-denominator mediocrity." Rick Wilcox: "Thanks be that I'm retired and have all the time to do whatever I want. Even this. To paraphrase the quote of an old quote, I feel like the little old man sitting in his rocker: 'When I feel a worry comin' on, I just go to sleep for awhile.'" Bob Smith: "The last time I can remember an eight-hour workday is way back in 1985. After that I became self employed. Ten/twelve/fourteen hour days five to seven days a week when work was to be had. Fortunately my business is commercial door, frame and hardware installations. So even in skinny economic times there has always been some work to do. Everybody needs a working door right? "There would be times when work slowed due to the season, weather, etc., and I had time off but that would be a little nerve-wracking since if I'm not working I'm not earning. "For a 4.5-year period I took a job with one of the companies I subcontract for, running the installation and service departments for their seven branches in the D.C., Maryland, Virginia area. Six-figure salary, benefits, whoopee! My wife was looking forward to me having a regular paycheck and set hours. LAUGH OUT LOUD. The most miserable time of my life. Sixty-hour work weeks, phone and email going off until I went to bed, complaints and problems to deal with from both ends. "When they came to me and said they had to downsize due to blah blah blah I almost kissed them. It's taken two years but I've rebuilt my business. Don't have any guarantees about where my next check is coming from except the quality of my work, and I'm happy as can be. I can take time off when I'm not scheduled with work and sometimes I can even plan some time off. Peter Allen: "Where does 37 put me in your reader demographics? I try very hard not to work too much. Mostly successful; means I can spend time with family and sleep. Still doesn't make as much time as I'd like for photographs though...."
Josh Hawkins: "Part of it is the workday. It's nonstop. Even when you're not working there are emails, texts and the dreaded phone calls. "Part is attention span, at least for me. I'm used to reading and reading a lot. The Internet has been great for the amount of reading I do if not the quality, but I read for, at most, ten minutes and move on to the next item. "Years ago I worked for a parenting magazine. We had a managing editor come in and the first thing she did was cut the word counts on all articles. This was before the Internet. I'm not old, really, but she wanted the articles to be the length a parent could consume before having to get back to their duties. In hindsight that change was really smart. (Sorry if I didn't address the issues very well. I skimmed the last two-thirds of your article.)" Hudson: "Mr. Ford liked eight-hour days because he could run three shifts a day. With a ten-hour day he could only run two shifts a day." Steve Biro: "I've spent the past 43 years as a journalist, mostly in television and radio. I don't think I've ever worked less than 50 hours a week during that time. Perhaps when I was in college I worked 40 hours a week at a local commercial radio station while attending classes full time. Even when I finally made it to a unionized gig in network television, it was still close to a 12-hour work day and often 18 hours during big news events. "Once, during hurricane coverage in the field, I worked 72 hours straight without sleep. But at least I was paid overtime as a producer-writer-editor (notice I was still doing the work of three, however). "The eight-hour workday wasn't just a humanitarian goal. Many corporate executives finally realized they were burning out their workforce faster than they could replace them. And yet there was still heavy resistance to a shortened workday. During the industrial revolution up until about the First World War, many American laborers were forced into retirement at about age 45. Most didn't have pensions but were simply worn out and could no longer work. The nation's brain trust finally realized eight hours was the sweet spot at which companies could maximize productivity and long-term worker usefulness. But most of those lessons have already been forgotten." Scott Johnston: "See Overwhelmed, by Schulte, for a comprehensive and entertaining exploration of this problem and various solutions." Leroy: "Organized a union. Fought. Certified. Communication Workers of America. ...And prevailed. Eight-hour days. Overtime after that. Holidays time and a half. Vacation. Sick time. Call back pay. Retirement. Health insurance. Disability. Payroll deduction. Seniority. Priority. ...Union yes!" Peter: "A couple of years before I retired (12 years ago), companies were handing out cell phones and Blackberries to executives so that they could get at you 24/7. If you had a workaholic boss it was like being married to him or her. Not to mention the constant e-mail bombardment. Besides working x number of hours a week, being on call like doctors used to be, add exhausting air travel to the mix. I hardly took a picture from 1985 through 2003. Had to retire to get back to it." David Elesh: "I retire at the end of June after 49 years as a professor and having worked 50–60 hours a week—as do my colleagues—since I started. Both my son and future daughter-in-law work 60–70 hours a week in completely different industries." Trecento: "Mike, I think I've read every article you've posted in the last five years, and almost every comment. I'm a fast reader by nature, and it is my primary recreation. Your writing is good, and is worth the time I've spent reading. (Though, I will admit the cost to me is less than the cost to others.) So much of what is out there is not meant to be read deeply, or is redundant summaries, or is trolling for clicks and arguing, or is erroneous, or is vague, or merely lacks insight. I know, because I used to read a sampling of all of it, much the same way, I suspect, you used to sample the firehose of online photography. "Your writing stands out, among a handful of other authors with a distinct voice. "Today, I have less time, and more (and better!) goals than I used to. I cope by focusing on those authors, and watching for posts on an RSS feed reader on my iPad. (The app is called 'Unread,' and I use the RSS service called Newsblur.) I recommend this approach to anyone interested in managing their reading time. I only have sixteen subscriptions, which breaks down into thirteen people, across six categories. The only feed that regularly produces links instead of long form posts is John Gruber's Daring Fireball, but his one sentence comments on those links is worth it. "I saw that you talked about how much time you spend writing—that you might be able to distill it down to three to six a day. I agree, that seems to be about my limit for continuous creative production. After that, it doesn't matter if I log more hours, I'm not going to achive more without a complete reset—which almost always means a walk, a decent meal, and sufficient REM sleep. I would be interested to hear how long you can work at one go, creatively. "I fear that my white collar peers are dooming themselves to 10–14 hour days by letting their time be shredded to confetti by constant interruptions, task switching, and the miasma of 'continuous partial attention' that comes with email interruptions, messaging, facebook feeds, and the like. There is only so much work you can get out of a person in a day, and so much attention to bo around, no matter how willing they are to burn the candle at both ends, up the middle, and down the other side. Joel Sapolsky wrote an excellent essay on this called 'Human Task Switches Considered Harmful' some fifteen years ago. I recommend it." Harrumph. Two members of the TOP "family"—is it too much of a stretch to call it that?—the TOP fellowship, if you will—bought new cameras, and both wrote to tell me all about it, and neither one included a picture. Wah! Just for some idle Saturday fun—show us your new camera! Points for a good (or creative, or different, or beautifully made) picture, but a quick (Facebook-worthy) snapshot is okay too. ...Where http://image.jpg is a picture on the Web no more that 470 pixels wide. Sorry, there's no way to upload a picture directly from your computer to the TOP Comment Section. Or, you can post a link! If you don't have a new camera and you'd still like to play, then show us your oldest camera if you have any old ones. I'm hoping John and Ctein will send portraits of their new ones, but if they don't, maybe Carl and Oren (and Herman K., and Jim Hughes, and several others I can think of) will show us their oldest ones. It's a Rochester Optical Co. Pony Premo No. 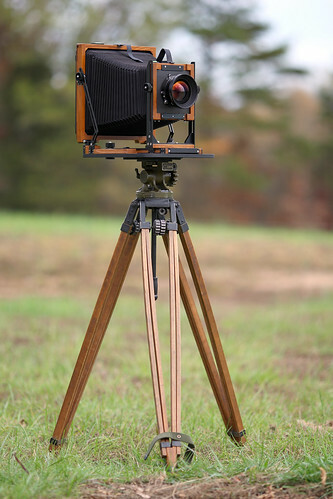 6 whole-plate "self-casing" camera built between 1903 and 1906, and I am inordinately fond of it. It's a survivor, in spectacular condition for its age. It resides in the "front hall," meaning, the southern side of my little living room between the front door and the foot of the stairs. So c'mon, what did ya get! NOTE: I have "featured" a few comments, but you should click on the "Comments" link below to see everyone else's pictures. But do read Doug Chadwick's written comment below. —Ed. Mike replies: That's wonderful. Thanks very much. Earl Dunbar: "The OM-1 may not be my oldest camera, but it enjoyed the day and the visit. "iPhone 4s, so not great dynamic range." Doug Chadwick: "My prettiest camera looked very much like your Pony Premo, and might well have been a close relative. The front of it was a Century Grand Senior, and it had a Century #8 Cirkut "Attachment" on the back. And of course it had the 12" cog-wheel head and legs. And it had a little tag on the front standard to remind you to set the front standard to the center before closing the camera. A hang tag. And it had all the little booklets and sales brochures that convinced the first owner to take the plunge. "He took the plunge in 1906 and kept a faithful log of the exposures he made with the apparatus, in yet another provided booklet, but it just amounted to about 6 photographs. I got one negative and one print out of that set. Both Central Park circa 1906. "It was, and is, about as 'mint' condition as anyone will find. I would guess that is is the best early Cirkut extant. It recently sold at auction for a respectable price. I have not bothered to get in contact with the new owner. I didn't own it for a long time and the rest of the ownership chain are well enough known. I was an insignificant custodian for something like 10 years. I got it on television once, good enough. "I am not a collector, and that's what a camera like that needs. "Oh, and it had a really good lens. Probably the most 'important' looking lens I have ever seen. It was a hugely expensive optional upgrade in 1906. A Zeiss triple convertible Protar. I have never looked at a lens that just from its very appearance conferred such quality. It cost, at the time, as much as the house where I was living. It kind of took my breath away. I never exposed film with it. "We are impressed these days with the traditional engraved lettering filled with paint on lenses. This was not good enough for Zeiss in 1906. The 'engraving' was raised writing done with some sort of electrical welding. Or something like that. I am sure the experts know something about how it was done. Very exceptional. "But there was something about the look of the glass, and its 'natural' coating that just stood out from anything I have owned or seen before or since. Some sort of brilliance or clarity, I am not sure what. "I am still quite sure that lens is capable of something really special. "I am equally sure it will never be used to expose film and prove what it can do." David Miller: "You swine, Johnston! I have no photograph of my newest camera because, after rising to the top of the wait-list at my local camera store yesterday, I finally got my hands on a Fuji X-Pro2. However, after an hour playing with it, I reluctantly concluded that—beautiful though it is—the Fuji X-Pro2 is not the right camera for me. For now. I think…I could have done without having salt rubbed in the wounds of my disappointment. By way of asserting my independence, I bought the Fuji XF 90mm lens whose usefulness you disparaged in a recent well-reasoned post. There—I can think for myself! (Buying a three-wheeler Morgan would have been even better….)" Mike replies: And buying an electric three-wheeler Morgan would have been even better still. How does one look at a photograph? How do you approach it? Back when I wrote a weekly column (and thought that was hard), I had in mind writing a long piece called "approaches to a photograph" that would illustrate some of the things that can be present in a photograph that allow viewers a way in. Really, it was more than a week's work. It was also difficult enough that I certainly wouldn't want to find myself under the gun of "having" to finish such an essay. What really stopped me up was the illustrations. My idea was to take one nondescript photograph and show some of what's in it—one illustration would block out lights and darks, another would present blurry areas of major color, and so forth. These turned out to be well beyond my limited Photoshop skills, then or now. This is not that essay. I can't write that one because it absolutely doesn't work in short form. It needs to be "novella" length and I don't begin to have the time. I have the time to do the writing, but not the research and the thinking! And, as I say, I don't have the competence to make the illustrations. Tonality. You can think of tones of gray in a black-and-white (monochrome) photograph as being analogous to notes of music. A picture can be founded on different "keys" (we even call the basic extremes "high key" and "low key"). Different emphases are associated with different emotional in the way that a piece of classical music in the key of C is associated with "heroic" feelings and D minor is associated with melancholic or romantic feelings. Different tones placed next to each other have different effects, like two musical notes placed side by side, as does the "length of the scale" or the tonal range, two imprecise terms that refer to how gradated the tones are between black and white. You can conceptualize this last by first imagining a picture made up of, say, three values, black, white, and middle gray, and then the same picture divided into, say, a hundred distinct shades of gray. Most "converted" black and white I see these days has about the same effect on me as a child bashing on the piano keys has on a musician. Atmosphere. Generally speaking, low contrast in black and white is atmospheric and high contrast (fewer grays, more of the tonal scale pushed towards featureless black or white) is graphic; graphic pictures lean more on design and atmospheric ones lean more on the description of space. It's no accident that Ralph Gibson, who famously has a high-contrast tonal palette, also enjoys, and has a feel for, graphic design. Likeness. How coherent is the report given by the photograph to what was in front of the camera when the photograph was made? Sometimes some very primitive photographs can be greatly enlivened by "the slap of truth." "Description" was a property often ascribed to large-format contact prints and their exacting report of texture, detail, and nuances of light. Colorism. Like tone, color is its own world, and the colors in a photograph can be detached from its other properties and appreciated or felt on their own. As with tone, a whole book could be written about how colors work; the best education is perhaps to look at paintings. It's very difficult to photograph in color well, and very few do. The biggest faults of color are that it can be too literal or too decorative. Where tone can be manipulated heavily for expressive purposes without violating the apparent "rightness" of the picture, color has a much narrower range of expressive possibilities. The greatest flaw of color photography is that color functions aesthetically as an overlay: even when all the other properties of a picture are perfectly managed, the color can be arbitrary because it has to be reported more or less as it existed, and Color can also often be at odds with the other properties in specific work, for instance in the work of Robert Bergman, a very sophisticated colorist whose work makes ravishing use of color in portraits of homeless people. Eyepath. Photographers often play with how viewers will see their pictures..."see" meant literally, that is, how the focus of the viewer's eye will be led from one area to another. In this photograph by Vanessa Winship, for example, the eye is led directly to the lower right so immediately that it induces a sort of vertigo; as we scan the girls' faces and decode their gestures (terror? pleasure? ), we're then led quickly "back" behind them, both because of the extreme perspective and because, instinctively, humans are impelled, when we see someone or something fleeing, to check what it might be fleeing from. This leads us to the enigmatic man, who doesn't appear to be a threat but isn't obviously benign, either, and from there to the disconcerting fact that the perspective lines don't lead all the way to the horizon; the path is cut off by the sea. We might very quickly scan the sea and the pole to see if they're relevant, all the while flicking our eyes back to the expressions of the girls to read their feelings. (Note however how the pole with the cluster of hardware perched atop it increases the steepness of the shoreline with the white breaking waves.) Next we detour to the figure crouching in the rocks who might take a moment to decode...not big enough to see, really, in this small JPEG; is she fishing? No, the fishing pole is lying on the concrete; the girls are running over it. Along with the gritty tonality, the gray skies, and the barbed wire, the agitated, disturbed eyepath contributes greatly to the sense of unsettlement and imbalance in this picture. Connotation. This is personal and different for everyone, but pictures, like smells, often have personal associations that trigger certain feelings. I worked with a guy once who had a terror of the woods and hated trees; he's obviously going to have different connotations toward wilderness landscapes than a veteran hiker who's a naturalist and environmentalist. The "universe" of connotation in photographs is endless and rich, and is a primary reason for two interesting properpties of photographs in general, namely, why photographs are different for everyone, and why even wholly realized photographs can be only one part of the communication between the photographer and the viewer. Viewing can be is active as well as passive. There are many sub-topics of connotation as well, for example subject obsession; I saw some photographs recently by a man who adores firearms, and his interest was apparent to me within minutes. I could write a whole chapter in this nonexistent book about subject-obsession! Personal association. And connotation, which might have nothing to do with what's actually in the picture but only remind you of something, is not the same thing as personal association. An obvious example is to imagine how a plainspoken portrait of a woman is different when viewed by a) a total stranger, b) her husband of twenty years. But association can be more general. When something is described in a novel, it's well understood that the novelist intends for the reader to fill in a great deal of the richness of that description from his or her own experience. Stephen King calls this "conjuring" in his book On Writing. If I say "the smell of freshly baked cookies," you probably just remembered that smell; but I didn't provide it for you. I'm depending on your experience to fill in the blank. The same holds true for many photographs. People who actually experience mountain vistas will get a lot more from a photograph of a mountain vista than a city dweller who has never been to the Rockies or the Alps. People use their own experience to fill in or enrich all that's missing in a photograph all the time, and that reflex can have a lot to do with what makes certain photographs relatively rich or empty for each of us. Fact. Most pictures contain some facts, even if we don't know what they are. The photograph that I intended to use for the unwritten essay I'm sketching here was of a locomotive parked on a siding in exurban Chicago. A basic example of the facts in that picture are that the siding has a location, the locomotive is of a certain type from a certain manufacturer, it is run by a particular railway, identifiable based on its colors or "livery," and the letters and numbers stenciled on its side have a purpose. I didn't know what any of those facts were, but someone does, and those facts are there to be seen in the photograph for that person. You get the drift. I'm only getting started, but I'm beginning to get tired, and it's 11:00, which means I'm late getting a post up, which always makes me feel a rising tide of deadline stress. But I could think of many more topics that these eight; not ten more, but fifty more, and twelve examples of each, and sub-topics for each, and discussions of the nuances of each topic could go on for pages. And if I wrote a 45,000 word essay on this topic with 200 illustrations bit by bit here on the blog, by the time I was done I'd have 170 very happy, satisfied readers left and I'd be applying for a job at Taco Bell to help pay the mortgage. We ain't going too much further down this hole. (Old Jeff Foxworthy joke: If your wife is staring intently at the frozen orange juice because it says "concentrate" on it, then you might be a redneck*.) Suffice it to say for now that the practiced, fluent visual literacy that allows us to almost literally glance at a photograph and process it instantly is a highly developed skill indicative of great mental prowess and deep familiarity with the medium, but...(note that a "but" in the middle of a sentence has the effect of negating whatever went before it)...but you get much more out of certain things when you concentrate. A great deal of what there is to be gotten out of a photograph depends on the quality of attentiveness that we bring to it. It's a skill to look fast, but a gift to look slow. *He's an American "country" comedian whose schtick is "If...then you might be a redneck." "If you think a 'turtleneck' is an ingredient for soup, then...." "If you've ever raked leaves in your kitchen, then...."
What's the Purpose of Taking More Photographs? The so-called "digital tsunami" has unleashed an unprecedented number of new photographs on the world. It's marvelous, literally—in the sense that it's something to marvel at. Doesn't even need to have a number attached, because the numbers are past human scale—untold billions, trillions even. If you are the median age in the USA—37 years old—and you will live an average lifespan for a male, which in the USA is 77—and you looked at one picture per second full time, eight hours a day, five days a week, fifty weeks a year for the rest of your life, you wouldn't have enough time left in your life to look at all the photographs that are uploaded to Facebook in one single day. One day. (The numbers are 288 million—that's the number of working seconds you have in 40 years, and 350 million—that's the number of photographs being uploaded to Facebook daily, according to a Business Insider article published in 2013 which cited a Facebook white paper.) And that's just Facebook...never mind all the other pictures uploaded to thousands of other sites, and never mind all the pictures that are taken but aren't uploaded anywhere. And never mind the pictures that will be uploaded tomorrow, or the next day, or the day after that. And when are you going to catch up on all the pictures that were uploaded before yesterday? That's the only way I can quantify the digital tsunami to myself. Other methods boggle the mind. The French theorist Roland Barthes was the first person to suggest that when any of us talks about "photography," we are only talking about the small subset of "photographs I have seen." We've all seen millions of photographs, enough that we all feel we know intuitively what photographs are and what photography is all about. But now more than ever, the subset of photographs that each of us has seen is infinitesimal beyond human comprehension, like a handful of sand compared to ten galaxies. We can't even comprehend how little it is. I would suggest (he wrote dryly) that in these circumstances, the sensible course of action is not to depend on volume as a strategy for getting your work noticed or seen. On the good side, it's probable that more people than ever before are looking at more photographs than ever before. The audience is bigger and, even as we decry "shorter attention spans," visual literacy has increased such that viewers can take in more picture more quickly. Please like my work at facebook.com/pages/robt-frank! Traditionally, the way to draw attention to a photograph was to work hard on it. Plan intelligently, shoot carefully, craft well. Example: Walker Evans could work hard all day for the FSA and come home with six sheets of exposed film. Then, with rollfilm, a new method arose: shoot looser, be more experimental, and let your "hit rate" (as it's called now) plummet—and edit after the fact, ruthlessly, using only those few shots that seemed to have some special sort of magic or that together make your artistic point. Example: Robert Frank exposed approximately a roll of film a day for two years while traveling all across America, roughly 28,000 frames, to get the 83 pictures in his book The Americans. Both methods allow a lot of control and authorship, but in different ways. In the 1980s, an accomplished pro (standing at the counter of the old Penn Camera in Washington, D.C.) told me a guild secret. The only difference between a pro and an amateur, he said, was "we shoot more and show less." Even as a full-time art student, I couldn't shoot much. I bought my film in bulk rolls, loaded it into cassettes myself, and developed it by hand, but it was still expensive and time-consuming. So when digital came along, it was assumed it was going to be a huge boon to everyone. Now, everyone could "shoot more." No more per-shot cost. No more time-consuming chores just to get to the proofing stage. Everybody's work would improve! Now anyone could shoot 28,000 frames to get 83 pictures. Well, no. If Walker Evans was a Gen-X'er today, he'd be shooting 200 "captures" with a high-MP FF camera every day and mentioning to friends how far behind he is on his editing. And admitting ruefully that he hardly ever gets prints made any more. Robert Frank, of course, would have put all 28,000 shots on Facebook and would spend his days fishing for Likes. And of course no one would have heard of either one of them. My point here is just this: that the point of being able to take more photographs is to show fewer of them. Not more. Be more selective, not less. Digital is fantastic—if someone previously threw away 90% of their shooting, now they can throw away 99%. If they previously threw away 99%, now they can throw away 99.9%. It should help the quality of peoples' work to improve. What else are they taking all those captures for, anyway? Paul Emberger: "Something else interesting has happened in recent years: people spend less time looking at photographs, and attention span has decreased. When you take this concept together with shooting more, you see interesting behavior. "My students shoot a lot of frames, but they spend very little time sussing out the image from each subject. I'll see 200 frames in an hour of shooting and only one, maybe two frames of any single subject. If there are more, it is of the 'spray and pray' variety. "I implore them to slow down a bit and think more about their compositions. I also encourage them keep shooting beyond the point at which they think they "have" the shot. "One of my favorite assignments to hand out is to shoot 100 frames in 100 minutes of the exact same subject (all frames must be different). They loathe the concept when I tell them. But by the end, most see that the best images they made were after spending considerable time with the subject. "One interesting space where my students are ahead of me on the curve has to do with the feeling of individuality. When I came up, photography, as you've said, was expensive. It was also mainly a solitary pursuit. I spent years both in and out of school honing my craft. I began to develop a sense of individuality and that my images were markedly better than those of the average amateur. At the time, this buoyed my sense of being a professional, which I had been since 22. I erroneously thought this was sufficient to make me different from the masses for now and in the long haul; after all, I should only get better...right? 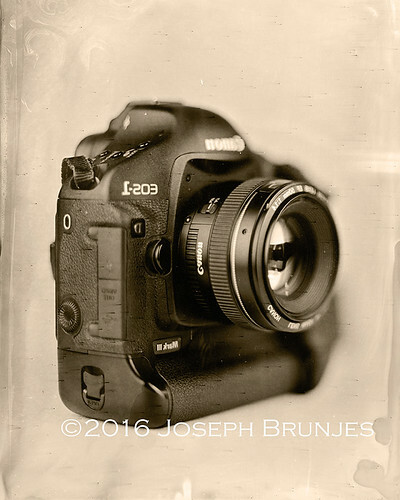 "Where as my students have come up in the time of ubiquitous cameras. They're everywhere. Everyone take pictures of everything. And photography is no longer solitary. They organize huge shooting parties and outings. They see from the beginning that others are capable of making images equal to their own. And that an eye towards composition is not unique. "In this new era, I've had to re-access my position in the world of image making, to realign my center with the fact that there are thousands of people capable of making the images that I am capable of making. It has been an interesting few years for me. But my students are there by default. They don't have to suffer the tortures of King Sisyphus, as I do." Lynn: "There may well be a digital tsunami of photographs, but most of them are not what 'photographers' would think of as 'photographs'—they're the digital equivalent of post-it notes taken by cell phones and pasted on social media. Here's what I'm eating at the moment. Here's Karen doing duck-lips. Cell phone cameras and social media have enabled this. Amateur photographers are taking more photographs thanks to digital, but I suspect that after the first few years of enthusiastic spraying with wild abandon, the task of editing might encourage a little more thought before filling up another hard drive. Although now with unlimited cloud storage and better tagging, I wonder if people will bother to edit. Particularly if the subject is cats." mbka: "I have similar misgivings about commenting on blogs. Any conceivable comment I could make, or thought I could have, has already been made and thought by someone else. "Seriously though, I do notice something different in pictures of masters vs. pictures of amateurs, even good ones. I often look at floods of images on DeviantArt. These are mostly by good amateurs, very good ones, or pros great at their craft, but not 'masters' for lack of a better word. And I really just click forward. I don't spend more than half a second per image. These are often technically outstanding images, mind you, pre-selected in groups by subject. "Then at some other point I look at portfolios of true masters somewhere else, or single images coming up in news. And I look at them far longer, I find them emotionally compelling, outstanding as images, not just as captures. I could never pinpoint why that is so. But some people do shoot images that are more compelling. "So digital has enabled a leveling of the craft side. Good craft has become commonplace. But it has not done the same for the art side. Good art is still rare." I grew up understanding a fairly clear demarcation: some photographs were made to be taken in quickly, even instantly, and others grew on you slowly, or demanded closer attention...or rewarded closer attention. The former were superficially attractive and evoked a sort of low, knee-jerk response, of the sort that men get from pneumatic cleavage or women get from cutesified babies. Or however it might be done: with schmaltzy colors, or clichés, or conventional "composition," whatever. I took it for granted—equally unexaminedly, probably—that other photographs were worth looking at longer, puzzling out, feeling into, living with. They could be quiet, or confrontational, or challenging, or mysterious. They yielded up their pleasure more slowly, but their rewards were more nourishing, more complex, longer-lasting. Lately I've been feeling that people in general do much less of the latter kind of looking now. Is that true? I don't know what the basis is for that conclusion—is it just me? Could be. Is it that photoculture has really changed, and people are looking for a quick "Like" and then—harried, overwhelmed—move on? I don't know. Maybe it's just a sense I get. I know I, personally, don't see nearly as much coherent, redacted, conscious work as I used to. Maybe that's just a factor of my age and stage; when you're new, naturally you look at the greatest hits of the past, like someone learning about classical music for the first time will listen to Beethoven's Fifth, Bach's Brandenburg Concertos, and Vivaldi's Four Seasons. Arts can seem richer when they're new to you, because you're speeding through the crème de la crème. And when your main way of looking at photographs is either books or shows, naturally there's a tendency for such expensive, limited methods of presentation to require a lot of back-end work on the part of the artist. It's certainly not like I don't look at books or shows any more, although I see fewer of them. But most of my viewing is done online, and collections of work thrown together online are seldom so thoughtfully presented, even when the artist is trying. Bill Poole: "Interesting! I'd comment on this, but I really don't have the time. Gotta go." lyle (partial comment): "For your consideration: from Artnews: 'According to one study published in the journal Empirical Studies of the Arts, museumgoers spend an average of just 17 seconds looking at an individual painting.'" Bill C: "Timely post. I've been thinking about this quite a bit lately. Thumbing through back issues of LensWork one finds so many photos worth exploring over and over, just as one example of the latter category you describe. I would love to see TOP explore some individual photos in more depth. The site contributors all have tremendously informed opinions as certainly do the majority of this site's visitors. Not only would it invite deeper discussion, I think it would inspire all of us to make more prints, or plan a book, or otherwise think about how to contribute to the depth that this form of visual communication is capable of." Stan B.: "No doubt 'everyone' now looks at photographs like editors burning through a pile of year old, cold call portfolios. It's all part and parcel of the instant access, instant sharing digital revolution. I know this for fact because I frequently fall into said trap, more than ever now, and have to remind myself to slow down and look at the photo, not past it. Enjoy it, savor it, look at it close up and from a distance, notice the details (not the pixels), ask yourself questions about it—and then at some point, return to it." Auntipode: "The photographic equivalent to the devolution from literati to twitterati, perhaps?" John Garrity: "I’m sure you are right. It’s an inevitable byproduct of both the proliferation of photographs and the predominance of distribution and viewing online, with its few knowledgeable curatorial gatekeepers. It’s always been the case that some photographs were designed to have an instance impact, compared with the slow burners. Now, however, the slow burners are overwhelmed by the predominance of the easily consumed. "In the distant past I was blown away by a Eugene Smith photographcarefully designed and crafted by him to produce a visceral impact on the page. At the same time I didn’t get Walker Evans. It probably took me three years before I could 'see' Walker Evans properly. Now thirty years later the Smith picture which made the hairs stand up on the back of my neck, leaves me cold, while I continually find fresh things in Evan’s work. This was only possible because the work of both was available in books, both of which I still have and which will still be functioning perfectly long after I am gone." Joe Holmes: "I think you're onto something. I saw the evolution of something similar a while back. About ten years ago I shot a project that consisted of silhouettes of people at the Museum of Natural History gazing on the African Mammals dioramas. The series was so successful that I returned three years later to shoot additional images. But in that short time, things had changed dramatically. I found it almost impossible to spot people stopping to contemplate the dioramas. Instead, people would cruise the room with their tiny digital camcorders, seeing the exhibits float by on the LCD, or they would shoot them with little digital cameras. It was so striking and dismaying that I turned it into a new project (and you can compare the two projects on my portfolio site). No more gazing. No more contemplation." David: "I would really enjoy a regular exercise of seeing a photograph and having you give your interpretation/deconstruction of it. I enjoy photography and looking at photos, yet I'm always bothered that I'm likely not diving past the initial impressions due to my lack of visual literacy. I started the MOOC class offered by the NY MoMA through Coursera (Seeing Through Photography) that you linked to a few weeks back. The class has helped, but I feel it gives more of an art historical perspective (not unexpected, of course), whereas I wonder if there are other approaches. I feel frustrated at times because in my attempts to become more visually literate, I feel like I need to read a thousand books on art histories and their corresponding time periods, politics, cultures, and styles, etc., before I can even begin trying to tease more meanings out of a picture. I'm hoping a regular exercise such as what you propose will help better inform me why I like certain photos. And that will hopefully translate into me adapting a more focused approach to becoming more visually literate. "Please do this sooner than later!" c.d. embrey: "Show me something I haven't seen before! It doesn't happen very often. I see very few photos that are worth a second look (because I've seen them all before). YMMV." Graham Byrnes: "The problem would seem to be deciding where one should invest one's time: there are many that will not reward long-term viewing, and most of us have limited time to invest. Once upon a time we relied on editors, gallery owners and curators to do a preselection, on the basis that if it was being hung in an exhibition there must be something to it, even if I don't see it immediately...so I'll persist. One supposed that the market had selected those gallery owners and magazine editors able to make valid, relatively rapid judgements...just as we relied on movie and book reviews. However that was corrupted by some practices of conceptual art, where the fact of being hung in a gallery was the only thing that made the work special, or the work was selected to represent the vested financial interests. So the web promised to bypass these problematic gate-keepers...at the cost of leaving us to try to select from the auto-route traffic of images zooming past, those which I should pick out and investigate...."
Check out this tweet by Irish freelance creative Davy McDonald...it's a poster for Nikon eyeglasses he found at a camera store and opticians in Belfast (I assume a Black & Lizar's?). Whoops! My guess is that somebody at an ad agency somewhere is wishing he lived on a different planet right about now. Or if not yet, soon. [UPDATE: This just in...Ken Bennett discovered that the picture is a stock image from Shutterstock. Anybody who's been connected to advertising or publishing can probably spin some yarns of similar things happening. I remember hearing tales of the fallout from the late David E. Davis, founder and Editor-in-Chief of Automobile magazine, when a vehicle was misidentified on the magazine's cover. The campers were not happy at Automobile's offices that day. My favorite story along those lines was one I heard during my short tenure at Model Railroader magazine. Kalmbach Publishing had an ace graphic artist who was a beta tester for Adobe and could do miraculous things with Illustrator. It seems this artist had many other interests, however, one of which was space travel and aliens and so forth. Once, after he finished working on a cover image for the magazine—a picture of a locomotive under power—he created an alien engineer and placed it in the cab of the locomotive, as a private joke for some friends. Of course he removed the alien from the file that was to be used for the real cover of the magazine. ...Or so he thought. Somehow—he explained it to me, but of course I've long forgotten the details—the file went off to the printer with the alien inadequately hidden, and the version with the alien engineer in the cab got printed on hundreds of thousands of magazine covers. Hawkeye Syndrome saved the guy's job—that's what my brother called the plot line when Hawkeye Pierce on M*A*S*H would get into hot water and then get off the hook by demonstrating how indispensable he was as a surgeon. The Illustrator ace was too valuable to the company to be punished. It was a while before he lived it down, though. This one probably isn't that bad. I'd like to be a fly on the wall at Fuji headquarters as this gets around the Internet, though, wouldn't you? They'll probably want a few of those posters. Tim Auger: "I remember being told of a book put out by a very reputable publisher of music books. On the cover was an image of a grand piano. The designer, being a designer, flipped the image left-to-right, to accommodate the typography more elegantly. Thus was created the only grand piano known to have short strings played by the left hand, and long strings played by the right. I believe they caught it just in time...."
Dave Stewart: "Another earlier one from Nikon. I noted it was amended a day or two afterwards." Mike replies: A Canon being used in a Nikon ad is telling. A Canon exec told me in the early '90s that by the late '80s, Canon was getting tired of hiring pros who shot their ad campaigns with Nikons. At that time, they had recently gone looking specifically for a pro who used Canons to shoot their ads. I should mention, though, that in the '70s, Canon was not a direct competitor for Nikon. Canon was one of a number of more or less equal companies that shared the mostly-amateur market; Minolta was the biggest of those. Nikon had the professional market largely to itself. By the '90s, though, Canon was emerging as Nikon's chief rival and a Canon ad campaign being shot with a Nikon would have been increasingly inappropriate, whereas it would not have been ten or fifteen years earlier. Mark Hobson: "Then there was the time I walked into Kodak's corporate headquarters to deliver finished B&W prints from a marketing photo project. I never gave any attention—and quite obviously, thought—to the fact that I was delivering them in an Ilford photo paper box (and yes, the pictures were printed on Ilford paper). Needless to state, quite a few marketing department higher-ups did give immediate and non-amused attention to the Ilford box. And I am fairly certain that, after the dust-up was over, I was ultimately 'saved' by the Hawkeye Syndrome." John Krill: "The ad is a classic case of 'You get what you pay for.'" Struan: "A local bank had an advertising campaign for their mortgage services, with big posters in each window with stock photos of bright young couples settling into bright young dwellings. One young woman appeared to be setting up house with two different men. A more worrying trend is the increasing use of stock images to 'illustrate' news stories. Odd that widespread availability and distribution of imagery should cause a trend to an even faster regression to the predictable mean." Mike replies: That last point is fascinating and deserves more discussion someday. Ed Hawco: "Using a Fuji camera in a Nikon ad is a mistake, plain and simple. Having an alien driving a model train is not a 'mistake,' it's just an odd choice, or a sight gag, or Easter egg. Big difference, if you ask me. "...And personally, had I seen that alien-train cover, I probably would have bought the magazine just for that, even though I don't have much interest in model trains." Mike replies: Well, when the editors and publishers don't want an alien in the cab, then an alien in the cab is a mistake, I can assure you! Although I was told that most readers assumed it was deliberate, whether they loved it or found it discordant. Michael Bearman: "It almost happened to me as a lawyer. I ran a case years ago for Agfa. Despite express and detailed instructions, all of the photo evidence came back printed on Kodak paper. I had to kick up a fuss to have the lab redo it all. Of course, the first thing the Agfa execs did when they came into the office to discuss the case was flip the prints over to check the paper." Tom: "The city of Birmingham, England once printed 720,000 leaflets featuring a stock photo of Birmingham, Alabama. Despite discovering the error, they went ahead anyway and distributed them."